Garrett Popcorn Shops serves only the finest, gourmet Popcorn. Using the highest quality, wholesome ingredients, our cooks handcraft our secret family recipes from scratch. Well-seasoned, old-fashioned Copper Kettles enrich our hot air popped, non-GMO kernels with a sweetness that is complex and compelling, which always leaves one wanting more. Every small batch of Garrett is thoughtfully prepared throughout the day for ultimate freshness. The world famous cheddar and caramel popcorn mix. Our secret family recipe of real cheddar cheese and oh-so-sweet, buttery caramel will delight your taste buds. Indulge in the sweet and savory flavors of handcrafted happiness—a Chicago tradition since 1949. 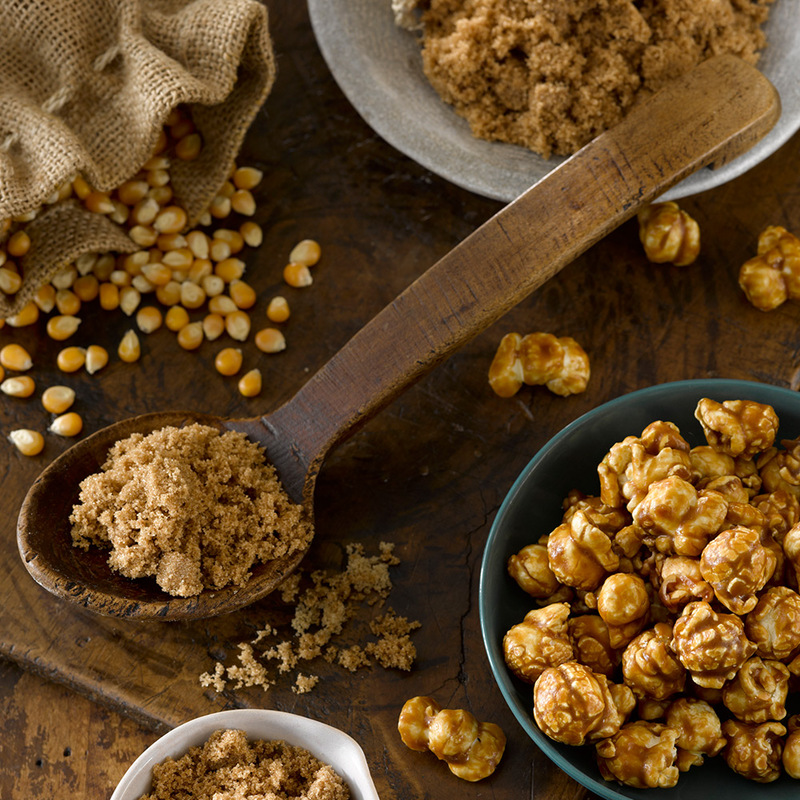 Buttery rich caramel popcorn for your sweet tooth. Classic and caramelized to the right color of perfection and nothing less. Freshly made in our copper kettles to give you that satisfying crème brûlée crunch. Gourmet cheese popcorn made with what else? Real cheddar cheese. Not artificial flavors. Freshly-melted, sharp cheddar is stirred into every small batch in our kitchen. Made just right for you to savor. Handcrafted with just the right amount of deliciousness, each batch of our buttery popcorn is made with only 3 ingredients: coconut oil, salt, and popcorn. For when you want to enjoy the simple pleasures in life. Our world famous CaramelCrisp becomes a tantalizing, tropical treat with the introduction of exotic macadamia nuts. Indulge in the sweet, caramelized almonds and our signature CaramelCrisp. We mix roasted almonds into our hot copper kettles of caramel popcorn to create clusters of nutty sweetness. A balance of flavors made to delight. Made with our special blend of non-GMO mushroom and butterfly kernels, they are hot air-popped throughout the day. A taste so fresh, you will soon forget that we left the salt and butter behind. Garrett makes the perfect gift for corporate gifting, events and trade shows! To learn more about these unique offers, please contact us using the form below and a Garrett team member will get back to you as soon as possible. Thank you for visiting. For general inquiries or more information, please fill out the form below and a Garrett team member will get back to you as soon as possible.